For other places named Ravenna, see Ravenna (disambiguation). Ravenna is a city and comune in the Emilia-Romagna region of Italy. The city is inland, but is connected to the Adriatic Sea by a canal. Ravenna once was the seat of the Western Roman Empire and later the Ostrogothic kingdom. It is presently the capital of the province of Ravenna. 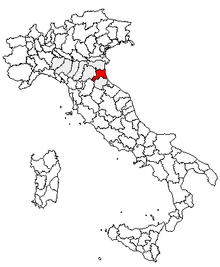 At 652.89 km² (252.08 sq mi), Ravenna is the second-largest comune in land area in Italy, although it is only a little more than half the size of the largest, Rome. Ravenna Facts for Kids. Kiddle Encyclopedia.